Are you planning new database development projects this year? Do you need to increase the scale, performance, security, or continuous availability of your existing systems to meet the demands of the business? Microsoft SQL Server 2005 is here, bringing significant enhancements in performance, availability, and security and the most powerful and flexible set of DBA productivity tools we have ever delivered. Our subject matter experts walk through all of the major features and enhancements built into SQL Server 2005 and demonstrate how you can bring these benefits to your organization. Topics covered include SQL Server 2005 management tools, security enhancements, high availability features, replication, and scalability. Also, tune in weekly through June 2006 as Microsoft MVP and Regional Director Kimberly Tripp and her colleagues present an 11-part series on building robust, recoverable, and reliable SQL Server 2005 systems. This first webcast of the SQL Server 2005 for the IT Professional series presents the new features designed to help improve administration, management, and operations. This webcast provides an overview of new features, how they fit together, and best practices for each. Building a robust, recoverable, and reliable system requires knowledge, best practices, and finding the right tool for the job. Join this series to learn how to build the foundation for success. Securing SQL Server system requires a variety of defenses. Microsoft SQL Server 2005 provides numerous mechanisms to reduce the attackable surface area, from features that are configured "off by default" to more complex features that can encrypt data to defend against rogue file copies of the database. Understanding how to deploy the wide selection of development and administrative options securely can be complex. In this second webcast of the SQL Server 2005 for the IT Professional series, learn about best practices for sorting through the options to optimally secure SQL Server 2005. Additionally, this webcast addresses security issues such as protecting and recovering data as it relates to encryption key escrow and recovery. Graphical installation requires you to continually click next through the options with the idea that you can always change the settings later. We believe there is a much better way. Make the right decisions at installation to ensure a more secure and properly configured environment. In this third webcast of the SQL Server 2005 for the IT Professional series, we present Service Account options, Authentication Mode, secure sockets layer (SSL) security (without installing SSL), password requirements, and installation directory structures. We explain code page and sort order selection for new and upgraded installations. 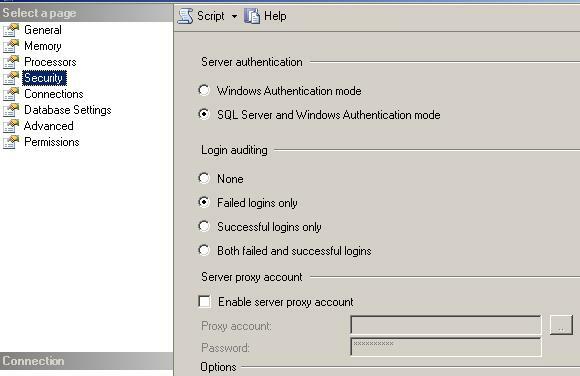 The session wraps up with the changes necessary immediately after installation: setting the system administrator (SA) password and using the SQL Surface Area Configuration tool and Configuration Manager. In this fourth webcast of the SQL Server 2005 for the IT Professional series, we help you prepare your migration path to minimize potential failures. In the first half of this session learn how to use the Upgrade Advisor and what to look for in your existing databases. The second half helps you to understand your options and explains the Copy Database Wizard, Detach/Attach, and Backup/Restore features. Join us to create a careful and easy test plan today so that your migration is easy tomorrow! Microsoft SQL Server 2005 introduces a new set of tools that are a radical departure from previous versions. If you want to avoid a steep learning curve attend this fifth webcast of the SQL Server 2005 for the IT Professional series, presented by Kimberly Tripp, to discover the new features designed to make the database administration and database development teams more effective and productive. Understanding the impact of the Microsoft Visual Studio shell—and where SQL Server Management Studio (SSMS) diverges from the standard shell—can help you to use SSMS more effectively. The primary focus of this webcast is on solutions, projects, customizing the query tool, and source control integration. SQL Service Broker is an integral part of the database in Microsoft SQL Server 2005. Understanding why developers may choose to use this is one part of the picture, but some internal SQL Server features use it as well. In this sixth webcast of the SQL Server 2005 for the IT Professional series, we present what new data objects comprise Service Broker, what new SQL statements you need to know about, and how you manage it, secure it, and monitor it, along with information about when it is appropriate to consider a Broker-based application. Join us to learn about dynamic management views and profiler support, in addition to how you can troubleshoot operational problems. The webcast also explains the internal functions run by Service Broker and how they work. Find the right technology for the job in this seventh webcast of the SQL Server 2005 for the IT Professional series. Join us to learn which technologies provide the right solution for a specific problem, as well as the pros and cons of each technology. Designing a system to protect you against the faults most likely to occur is the first and most important strategy, but finding the right combination to minimize both downtime and data loss is critical. This webcast covers all of the “Availability” technologies at a glance: remote mirroring, failover clustering, database mirroring, log hipping, replication, redundant array of independent disks (RAID), partial database availability, piecemeal online restore, database snapshots, snapshot isolation, and online operations. Database mirroring was released for testing when Microsoft SQL Server 2005 shipped as a product. As we approach the first service pack, get prepared for the release of database mirroring for general production use and understand the barriers of what database mirroring will protect against. Attend this first part in the eighth webcast of the SQL Server 2005 for the IT Professional series to obtain better insight for when database mirroring should be implemented as well as what to expect moving forward in service pack 1 (SP1). After learning about what database mirroring provides—as well as the changes to expect in service pack 1(SP1)—attend this second part in the ninth webcast of the SQL Server 2005 for the IT Professional series to walk through the entire process of implementation, failover, and monitoring. Join us for this slide-free session; it’s all about the demos. Microsoft SQL Server 2005 provides a variety of new features to help deal with the possibility of human error with preventative techniques, investigative techniques, and recovery techniques. Join this tenth webcast of the SQL Server 2005 for the IT Professional series as we look at data definition language (DDL) triggers, event notifications, partial database availability, partial database restores, and database snapshots. In this eleventh and last webcast of the SQL Server 2005 for the IT Professional series, Kimberly Tripp reviews key areas discussed throughout the series to ensure that all areas have been covered. This summary session should keep you thinking, give you more resources to review and use, and point to a few new areas to consider. Building a robust, recoverable, and reliable system takes a myriad of options. Join us to learn what the options are and how you can start making the most of them. A person tried to convert a varchar value to numeric and got the following message "Error converting data type varchar to numeric." --Error converting data type varchar to numeric. From their page: "Business Intelligence… some people think that is an oxymoron but my friend it is most certainly better than business ignorance which unfortunately is how many business operate. In the last few years most companies have been amassing data at a phenomenal rate but what does that data tell you? Well listen up because my guest today Andrew Brust is going tell you how you can use the tools in SQL Server 2005 to make sense of this treasure trove of competitive information because business intelligence is always better than business stupidity." In 1987 Microsoft and Sybase started a partnership to build/sell a Database Management System, based on the then (yet to be released) Sybase DataServer product. Sybase would have the rights to the product on the Unix/Mini Platform and Microsoft would have the rights on the fledgling OS2, and any other OS developed by Microsoft. From the page: "How much code have you seen that is devoted to simply shredding XML and storing it in a database? What if you didn't need to do that anymore? What if you could store XML in all of it's unstructured hierarchical goodness and just leave it at that? Well my friend, you are in luck because on this episode Shankar Pal of the SQL Server team is going to tell you all about the details of the great new XML support in SQL Server 2005." Let's say you have a table with states in your database, you only have 3 values NY, ME and SC. You want to order the result like this: first NY followed by SC and ME last. This was actually one of the questions that I have answered on tek-tips so yes data like this does exist. How do you attack such a problem? SQL Server 2005 will increase your programming options, productivity, analysis, and database management. If you have some basic knowledge of relational databases and want to start a career as a developer using SQL Server, then this book is your ideal first step. It explains the core jobs and roles for developing a database in both SQL Server 2000 and 2005. This book features practical steps to help you overcome issues you’re likely to encounter. You’ll learn to use SQL for querying, inserting, updating, and deleting data. You’ll also learn how to back up and restore databases for basic administration in SQL Server. Further, you’ll cover how to build a complete database, from the fundamentals of relational database design to table and index creation. Additionally, you’ll start to program in T-SQL, SQL Server’s implementation (and extension) of the SQL programming language, and you’ll come away with effective programming techniques using stored procedures and triggers. The book also includes a CD that contains an evaluation edition of SQL Server 2005 so you can start building database applications right away. How do you check if a temp table exists? Friday, February 03, 200610:00 AM Pacific Time As the first of a 14-part series, this webcast covers what it means to be a Microsoft .NET runtime host. Topics include how Microsoft SQL Server 2005 works with the .NET 2.0 application programming interfaces (APIs) to make loading and running code safe, reliable, and scalable. Tuesday, February 07, 20069:00 AM Pacific Time Microsoft SQL Server Reporting Services was released in 2004 to provide developers with an easy way to extract and share information captured in a relational database. In this webcast, we explore how to create basic reports, link them to together, and provide end users with a way to get the information they need. Tuesday, February 07, 20061:00 PM Pacific Time Join us to discover the many advantages of using SQL Server 2005 for application building. Friday, February 10, 200610:00 AM Pacific TimeThis second webcast of a 14-part series covers in detail how to write procedures, functions, and triggers using a managed language. Additionally, we discuss when to use managed code and when to use Transact-SQL. Monday, February 13, 20069:30 AM Pacific TimeAttend this webcast to learn about the new capabilities in SQL Server 2005 Reporting Services. Tuesday, February 14, 20069:30 AM Pacific Time This webcast shows how you can use SQL Server Analysis Services to build a highly scalable business intelligence infrastructure that supports the analytics your business needs to improve overall performance. Thursday, February 16, 20069:30 AM Pacific TimeThis webcast introduces you to the possibilities of data mining and predictive analytics. Friday, February 17, 200610:00 AM Pacific TimeThis third webcast of a 14-part series covers the new provider, System.Data.SqlServer, and discusses how connections, variable mappings, and other functions built into Transact-SQL are handled when a Microsoft .NET language is used. Monday, February 20, 20069:30 AM Pacific Time Topics in this webcast include: how to use the built-in expression language, report parameterization (data driven, multi-valued, and hierarchical), supporting multiple data sources (including relational, multi-dimensional, and XML), and making reports interactive. Monday, February 20, 200611:00 AM Pacific TimeThis webcast highlights security concepts that are new to Microsoft SQL Server 2005, such as encryption and user-schema separation, and looks at how SQL Server 2005 breaks security down into several distinct areas. Tuesday, February 21, 20068:00 AM Pacific TimeADO.NET is the standard method for Microsoft Visual Studio .NET applications to interact with data sources such as Microsoft SQL Server, the IBM DB2 Universal Database, and Oracle. Friday, February 24, 20068:00 AM Pacific TimeThere are many barriers to achieving high availability in a database system, and only some of them can be addressed by database management systems technology. This webcast examines some of the features of Microsoft SQL Server 2005—the latest release of the SQL Server product—that can help you overcome some of these barriers. Friday, February 24, 200610:00 AM Pacific TimeIn this fourth module of the 14-part series, learn about using .NET objects and how you can use them inside the database. Monday, February 27, 20069:30 AM Pacific Time Learn how Microsoft SQL Server 2005 Reporting Services is meeting the demand for end-user, ad hoc reporting. Monday, February 27, 200611:30 AM Pacific Time In this webcast, we introduce you to the enterprise-class capabilities of Integration Services including dedicated management functionality, collaborative development environment, and high scalability and reliability. You also learn how you can take advantage of SQL Server 2005 Integration Services to implement data quality, data profiling, and custom transforms in your organization. Tuesday, February 28, 20069:00 AM Pacific Time Find out about the new Report Builder in Microsoft SQL Server 2005 that allows end users to customize reports to their liking. Tuesday, February 28, 200611:30 AM Pacific Time This webcast presents the key architectural enhancements in SSIS that makes it extremely scalable. These are the countries where the bulk of the visitors for this blog are coming from. As you can see most of the visitors are from the US and Europe, Asia is in third place. 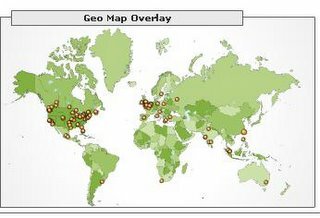 When I look at the maps day by day I also see some visitors from Africa and the Middle East but you need more than one visitor per city in order for it to show up in the monthly map.